In this week’s mindset podcast we welcome John Fotheringham to talk about habit forming, how to set goals for success and one aspect of language learning that rarely gets discussed. John is a passionate language learner and is running Langauge Mastery—a language learning blog and podcast dedicated to helping language learners. The focus of his website is 80% on language learning and 20% on Mandarin and Japanese. On top of his experience in language learning, more recently, John has been developing his knowledge on nutrition. I asked John on to the podcast to talk about the topic of nutrition because it is an important aspect of performance. If you aren’t sleeping right or your aren’t eating right, you aren’t setting yourself up for success in language learning. These mindset podcasts are about exploring topics outside of Spanish vocabulary or grammar. They are useful because because ultimately they will help you achieve your goals with learning Spanish more effectively. Nutrition and how you can improve your diet to improve your memory and ability focus and form successful habits. John’s first experience language learning in Brazil as a 12 years old. How is true love of language learning began with Japanese in college. Some of John’s struggles with the language gap in Japan. We cover some of John’s observations of the cultural experience in Japan. How you should think about priorities instead of maximising and managing your time. How to set yourself up for success by setting tiny, achievable goals. How to break up tasks to the minimum for focus. What it is like to work as a translator. John then explains how working as a translator and transferring those skills to having conversations doesn’t work as well as you might expect. What did you learn from the first part of the interview with John Fotheringham in this mindset episode? 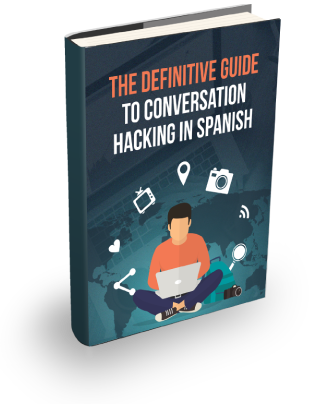 If so, sign up for access to The Definitive Guide to Conversation Hacking in Spanish. You will also receive weekly Spanish and language learning tips. there in the most effective way. 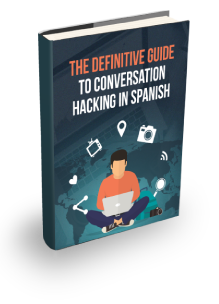 If you want to develop a conversational level of Spanish, then this guide will help you get there in the most effective way. We will only send you cosas muy útiles! We will only send cosas muy útiles!